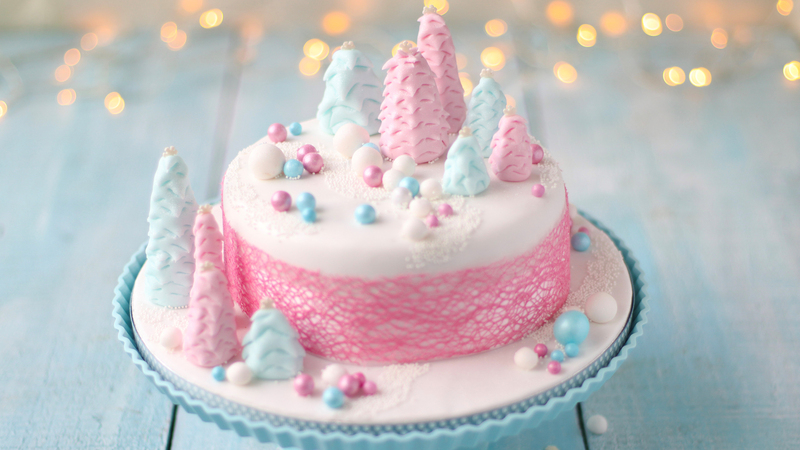 Create your own unqiue Christmas cake by adding colourful icing designs. These instructions are based on Supervalu’s Signature Tastes Traditional Fruit Cake by Kevin Dundon, which is a 6 inch cake. It’s important to give the marzipan the 24 hour time period to allow it to dry out a little and therefore avoid the icing paste from becoming moist and then soggy. Keep any sugar paste not being used, well wrapped and airtight to avoid hardening before its needed. Turn the cake over so the flat side is facing up. Warm the apricot jam a little to loosen it and then brush it all over the top and sides of the cake. Dust your hands and the work surface with the icing sugar and knead the marzipan until soft and pliable. Roll out the marzipan to about a 9 inch circle of about 5mm thick. Carefully lift it onto the cake and press it on top and down the sides evenly. Use a small sharp knife to trim the bottom for a neat finish. Use the ‘smoother’ tool to press the marzipan on smoothly. Cover the cake with a clean tea-towel and leave in a cool place for at least 24 hours. The cake is now ready for icing. Whether for yourself or as a gift, present your cake on a cake board for a professional finish and ease of moving around. Choose whatever colour icing you like to suit your cake. White is the most popular choice for this. Keep any ready to roll icing not being used, well wrapped and airtight to avoid hardening before its needed. Dust a work surface with the cornflour or icing sugar and roll the icing out to a circle a bit bigger than the cake board and about 3mm in thickness. Brush a light coating of edible glue all over the surface of the board. Lay the disc of icing paste on top, pressing it down lightly to stick. Smooth all over with the smoother tool. Use a small, sharp knife to trim away the excess icing from the edge of the board (wrap and reserve for cake decorating). Holding the board up is the best way to do this. Wrap some ribbon around the outer edge of the board to complete decoration if liked, attaching it with pins or double sided tape. Ideally, leave the board in a cool, dry place for at least 24 hours to allow the icing to harden before sitting the cake on it. Lightly brush the marzipan on the cake with edible glue. Dust a work surface with a little cornflour or icing sugar and roll out the icing into about a 9 inch circle of about 3mm thick. Carefully lift it onto the cake and press it on top and down the sides evenly. Use a small sharp knife to carefully trim the bottom for a neat finish (wrap any trimmings and reserve for cake decorating). Use the ‘smoother’ tool to press the icing on smoothly. Don’t worry too much if it’s not prefect as the decorations and ribbon, if using, can be used to hide any creases or marks! Carefully position the iced cake onto the iced board, positioning it off centre to allow for decorations to fit on the board also. Wrap the ribbon around the cake, if using, securing it with a pin or tying it in a bow. Divide each of the pink and blue icings into five pieces of varying sizes to give ten in total (eg. 5g, 10g, 15g, 20g and 50g). Taking one piece at a time, roll it between your hands to warm and soften. Once pliable, roll it into a chunky sausage shape, then tap one end off a surface to flatten and shape the opposite end into a point so it resembles a Christmas tree. Snipping with just the tip of the scissors, snip little tufts all over the icing shape to create a Christmas tree texture. Repeat with the remaining pieces. Decide on their positions on the cake and cake board before dabbing a little glue on their bottoms to stick down. Stick a ‘let it snow’ edible bead in the top of each tree. Swipe the edible glue in various places on the white icing and sprinkle the ‘snowdrift’ edible beads over to stick, brushing any loose ones away. Using the reserved white icing trimmings, shape as many small balls as will allow. These will be snowballs and look fun in varying sizes. Again, decide on their positions on the cake and board before dabbing with a little glue to stick down. They also look great cascading down the side of the cake. Arrange the sprinkletti multicoloured bubbles in the same way. Finally, spray puffs of the lustre spray on the trees to add sparkle and shine. Have a magical Christmas!